The photographic record of the ruins of contemporary war are everywhere to be seen. Buildings once cast as monuments to modernization destroyed in the blink of an eye, homes completely devastated as if hit by a tornado, dead bodies strewn amongst the debris of what was once thought to be civilization, and much, much more. We have written about it previously under the sign of “rubble world” (here in 2008 and here in 2012).” And truth to tell, even now in 2015 it doesn’t seem like it is getting much better. The photograph above is from Debaltseve in the Ukraine. 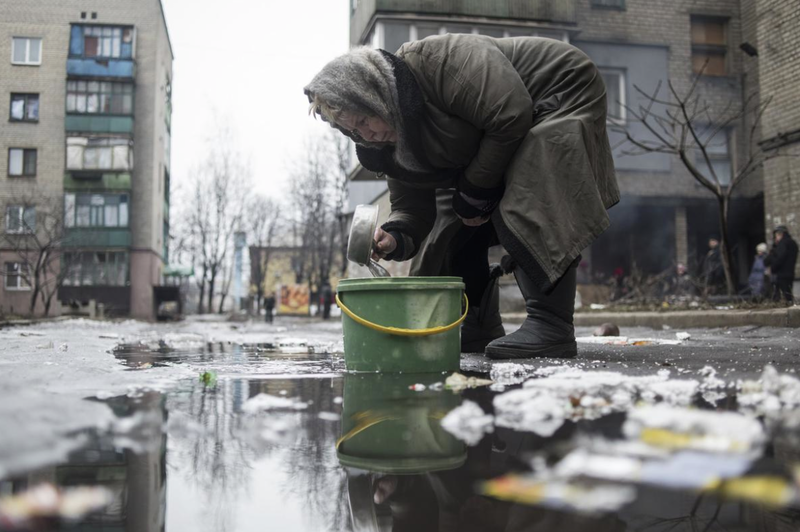 According to the caption “an elderly woman collects water from a puddle” and then goes on to detail the “particularly intense” fighting that is going on in and around the city. Of course the fighting is not immediately present in the photograph, but what we see might be more demoralizing for that very fact as what we are witnessing is not the death of individuals (which is tragic enough and in its own right) or the demolition of buildings (which can and in all likelihood will be rebuilt by whatever regime takes over), but the utter destruction of civil society. The surrounding buildings mark a modern society, as does the road on which the woman stands; but for all of that she apparently has no water running in her home and so she is reduced to scooping what she can from the ice melting on the street. The garbage strewn around her makes it clear that this is not without its risks, but the will to survive is strong and one cannot live without water; so she does what she can. And when winter gives way to spring and summer and the ice is gone, who knows what she will do. War’s horrors and tragedy comes in many shades, but as this photograph testifies its effects ripple throughout a society at the most fundamental levels, their most devastating effects implicated by the day-to-day demands on subsistence that stand as a constant challenge to the human spirit and make it hard to imagine the reconstruction of a vibrant and colorful society. The color cast of the scene in this photograph is grey and dreary, and it seems to offer little hope for the future—indeed, multiple shades of grey give little respite, but then this isn’t a movie in a fictional world. That said, what the photograph may well be showing us is the future—or at least one possible future—that could well test the limits of human resilience. One of the myths of modern journalism is that essence of war is found in the heat of battle. On this premise photographers risk their lives to get as close as possible to the action, while pundits and propagandists alike remind us that no one but the soldier can ever understand the experience of actually being there–an experience that can never be communicated to those who are only spectators. These conventional beliefs represent important truths about both war and representation, but they are seriously misleading as well. War is far more than battle, from the extensive organization that is required to project power and hold territory, to the thousand ways that it disrupts, distorts, corrupts, and shatters entire worlds. In seeing battle–if that really can be seen–you would see how war is fought, up close and terrible, but you would not be seeing all that war is and does. Professionals and the public have reason to complain about censorship, embedding protocols, and other restrictions on media coverage, but these issues also reinforce the sacralization of combat while distracting attention from its consequences. In fact, photojournalists are teaching the public how to visualize war, and not as a scene of singular intensity, but rather as a condition-one might say a catastrophe–that can slowly engulf all of society. As they do so, they also reveal how war’s predations expose the deep vulnerabilities in the human condition. The photograph could almost be an allegorical painting, with each of the figures an older version of the same man. There we see a younger man’s sense of personal misery, followed by the more reflective endurance of middle age, giving way to the renewed sense of shock and terror as the elder man confronts mortality itself. Set against the black background, they become figures of humanity rather than of any specific event or circumstance. 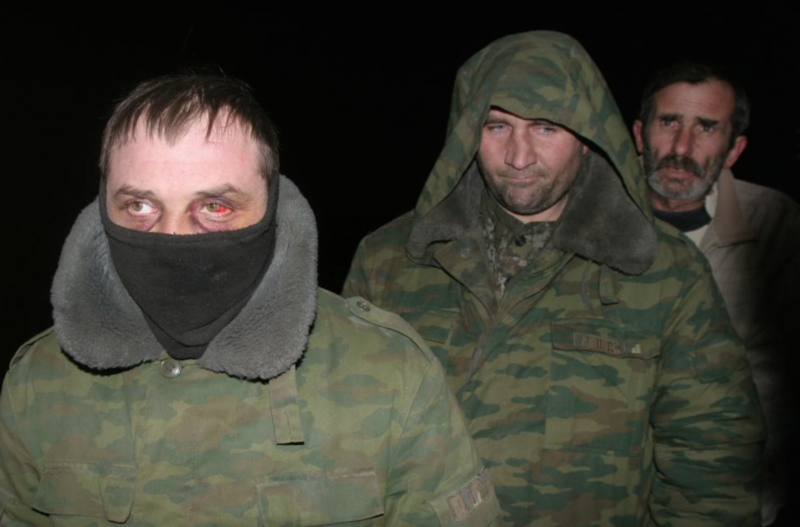 The photo still exposes telling details of the dire condition of the Ukrainian army, but it exposes more fundamental weaknesses as well. Not that we will all age and die (some won’t: they will die young), but that war is relentless in its ability to find ways to make people suffer. The suffering of war goes far beyond the terror of battle, not least because it brings everyone closer to deprivation. That may be its real advantage after all: no matter how far from the battlefield, everyone lives not far from their own frailty. “The face of battle” alludes to the fine book by John Keegan having that title. Keegan argued that those who conducted wars needed to understand how warfare was determined by the vernacular conditions and experiences of the battlefield, which could go unrecognized or undervalued in the strategic calculations of the commanders. That would seem to be another argument for getting close to the action, but it has other uses as well. In this case, the face of battle is to be found in both victory and defeat, and the particularities of failure may be the better basis for bringing distant audiences to understand or care about the specific situation. There is another sense to seeing these faces of battle. As Emmanuel Levinas has said, the face creates the most direct ethical encounter with the other: it presents the most basic sense of human alterity and vulnerability through the experience of another self, with the inescapable implication that “thou shalt not kill.” They are as we are, caught between suffering and death, irrevocably apart and profoundly dependent, and capable of being called to life only through their association with others not like them. As Judith Butler says, this encounter is at bottom a “wordless vocalization of suffering” that calls to us more deeply than can be communicated directly (Precarious Life, p. 134). So once again we are at the limits of representation, but with a difference. Now the gap is not between acting and watching or experience and abstraction. Instead, we recognize the profound difference between any two human beings, and how that gap both motivates murder and demands that we not kill. Wise counselors will say war is a stern teacher, but how often do they reconsider what it has to teach? 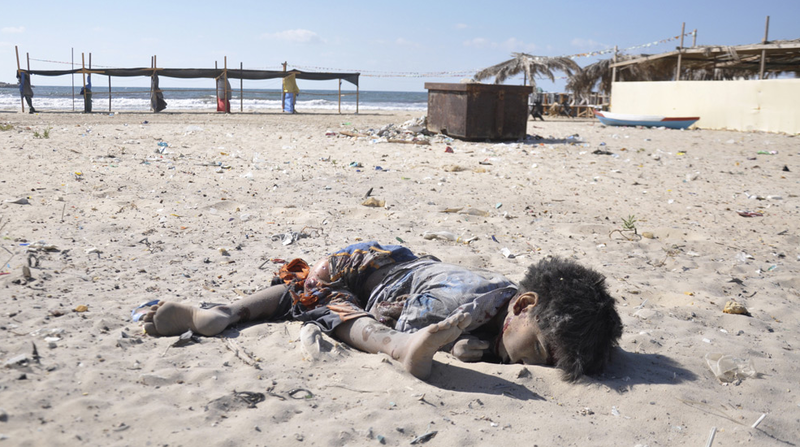 Look again at the photograph and ask yourself what can be learned from that sad retreat. Perhaps one reason people long for scenes of battle is that it is harder to face war as it really is. Photograph by a stringer for Reuters, near Zholobok, Ukraine, February 21, 2015. There’s an exception for everything, I suppose. Today’s post is on a non-image, the image I refuse to see. This is not an easy choice. Once decided, it is not easy to do. Let’s talk about the doing first. The images are already in my head, as I’ve seen enough already, thank you. They will continue to appear elsewhere as well. The Google Image search for something else, the news story or documentary film on the region, an artwork, an academic paper. . . . one way or another, the ban will fail. As perhaps it should. The choice is choice regardless of how well implemented. But why is it a hard choice? There are plenty of reasons not to look. Indeed, on this point both high-powered cultural critique and conventional norms of decorum overlap, albeit for different reasons. A great deal of photography theory has been devoted to saying why one should not look, why the image insults those being displayed and degrades those looking at them. More recently, some scholars and artists have pushed back: see, for example, The Cruel Radiance, by Susie Linfield, and Beautiful Suffering, edited by Mark Reinhardt et al. Who is really being protected, they ask, by not looking, and why should the image become a scapegoat for real violence? Frank Moller has provided an excellent analysis the dilemma, that is, of how it is both impossible to look and impossible not to look (“The Looking/Not Looking Dilemma,” Review of International Studies 35 : 781-794). Readers of this blog will know that I have argued against the critique of photography’s supposed complicity with violence, and for the way that photojournalism offers a reflective encounter with the human condition, but I also have claimed that, as in classical tragedy, the most compelling and revealing images of violence and terror are rarely those of visceral horror. Even so, I have no doubt that somehow my own moral sense and understanding of my country were fixed unalterably by seeing lynching photographs. I may not need to look now, but I probably did need to look before. So it is that the public needs to keep looking, even if that risks voyeurism. And so it is that we need to look at other things instead, even though that risks denial. Yesterday we learned that ISIS had burned a man alive. I couldn’t bear to look at the video, and the other relevant news images weren’t able to address the horror, and so it seemed that posting today on any other photograph would make the photo, and the post, into kitsch. As defined by Milan Kundera in The Unbearable Lightness of Being, kitsch “excludes everything from its purview which is essentially unacceptable in human existence.” Kitsch is a technique for denying abjection, filth, cruelty, and other horrors, rather than facing them to overcome them. Thus, not facing the execution seemed impossible, and yet I still couldn’t look. So it is that I had to find a better way of not looking. Burning a human being alive should be unacceptable to other humans, but it is not. Those defending the action can rightly point out that humans are burned alive all the time by bombs, rockets, artillery shells, and other weapons in the modern arsenal being used against ISIS and anyone else caught in the cross-hairs of the modern nation-state. But we knew that, and we see it from time to time, and it may matter that it wasn’t done for the camera. ISIS isn’t merely the latest thing in the slaughter pen of history. They are recreating a premodern way of seeing other human beings. All you need to do is enter into their visual world of headless bodies, dismembered heads, bodies aflame, and other scenes of spectacular dehumanization, and very quickly a sickening–and surely for some, exhilarating–transvaluation of values begins to undermine every assumption of modern, liberal-democratic civil society. At that point, looking really is dangerous–and far, far more so than photography’s critics had imagined–but for that reason perhaps all the more necessary. If you are to pull back from the abyss, you first have to stare into it, while you still can. So look. Then turn away. If you don’t need to look, I’m with you. If you need to look, you don’t have to apologize. Whatever you do, realize that the stakes are higher than had been imagined. For the same reason, know that it becomes all the more important to understand why ISIS exists at all, and how to break the cycle of violence and the downward spiral that serves them all too well. For that, we need many other images, and much more as well. Not least, we need to appreciate how civilization is a way of seeing. It’s like the day before, and all the days before that: back to business as usual in the war zone. This photograph of Iraqi war dead is from well before yesterday, but it still has a point to make. I don’t want to make light of the Remembrance Day commemorations around the globe (including the more optimistic variant of Veterans Day in the US). It is right and proper to remember the war dead, to honor all those who served, and to humbly acknowledge the debt owed by those who did not have to make the sacrifices demanded by war. But that is not all that is needed if we are to confront the ugly face of war in our time. The photograph above is a sure counterpoint to the solemn, stately, decorous rituals observed yesterday and relayed across the slide shows and other media. In those moments of observance, respect is paid, and war itself is recast as an exemplar of supreme values. The hard facts of loss are made explicit, and the actual carnage is abstracted into flowers, flags, dress uniforms, and the precise discipline of military ceremony. 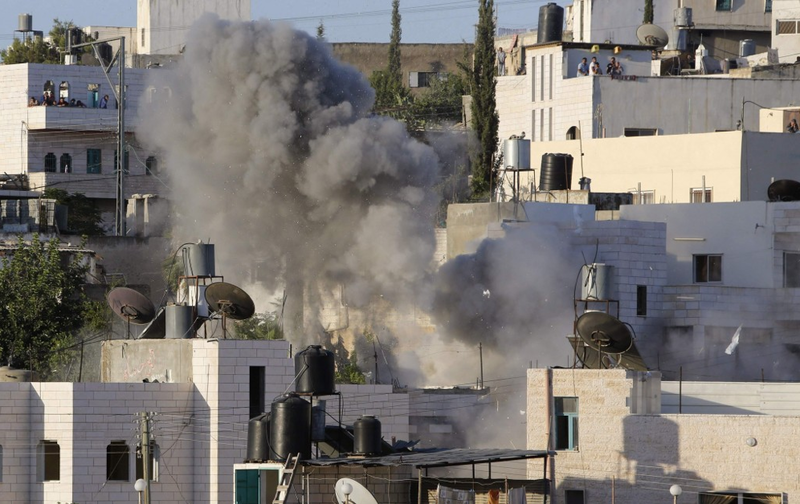 The nation reaffirms itself as a community of memory, and the reality of war is forgotten. The rest of the year, however, is a different story, and not least in the war zone. I’ve chosen this photograph because of the direct contrast with formal observance. 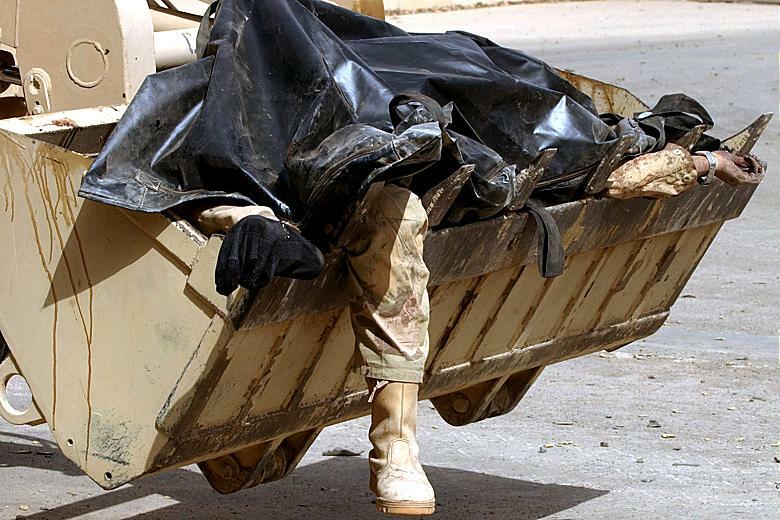 Instead of being treated with dignity, these soldiers are being handled like trash. Yes, they might get a decent burial eventually, but for anyone seeing this phase of the operation, the damage has been done. Civilians, other soldiers, and now you have all been insulted; not to the extent of the dead and their families, but close enough. That reaction is appropriate, because a truth about war has been revealed: it is not in the service of the highest values, because it degrades those values. It destroys lives, communities, and our common humanity. It converts the human world into waste. 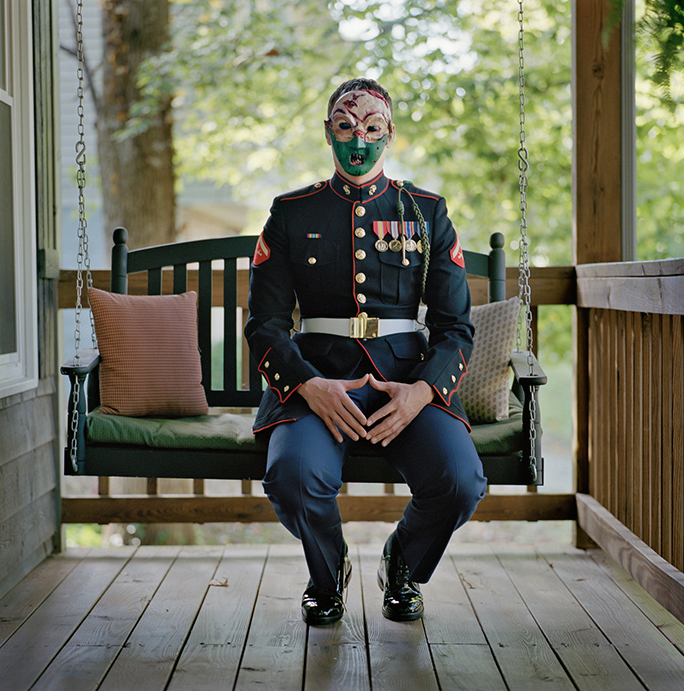 Much ink has been spilled about whether photojournalism should expose the bodily horror of war. This photo, like many others in the archive, demonstrate that less can be more: there is little need to see the gore, because more than physical destruction is at stake. If you do want to get closer to the mutilation that troops in the field have to experience, you can search for “war dead” at Google Image. Perhaps everyone should do that once, but it’s not what is needed on a daily basis. What is needed is to be reminded not only of the need to honor the dead, but also of how profoundly they and we are being dishonored every day by war’s vulgar contempt for decency. Photograph by Peter Nicholls/The Times (UK). Madness, Madness . . .
July 17, 2014. The day started with this photograph front page above the fold at the national print edition of the New York Times. 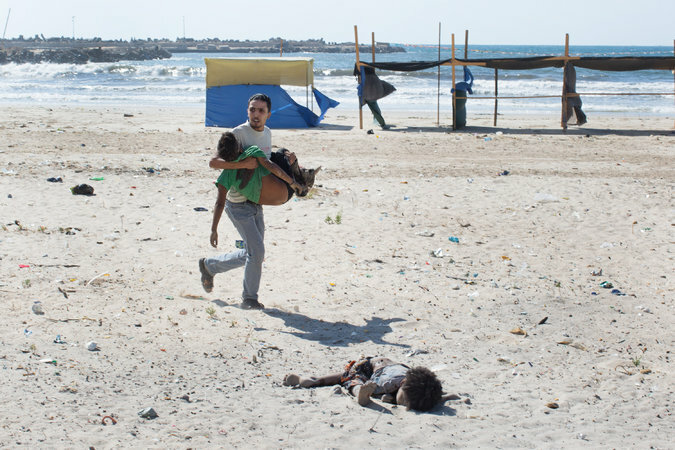 The Times published a report on the image by the photographer, so they must have known that, amidst the hundreds of photographs of the Israeli assault on Gaza, this one touched something deeper that the rest. It had moved a friend to send it to me after it appeared the night before in the digital edition, and I was torn about whether to write about it. On the one hand, it is a work of art that confronts the viewer with more than the public wants to know, it exposes the moral obscenity on both sides of the tragedy in Gaza, it highlights the incongruity between the suffering there and the desire everywhere to live with some semblance of prosperity and hope, and it does so by using photographic conventions that have long been ridiculed for their superficiality, sentimentality, and manipulative bad faith. On the other hand, I didn’t want to say anything because I’m just sick with the madness of it all. And that was before the news that came in during the afternoon. 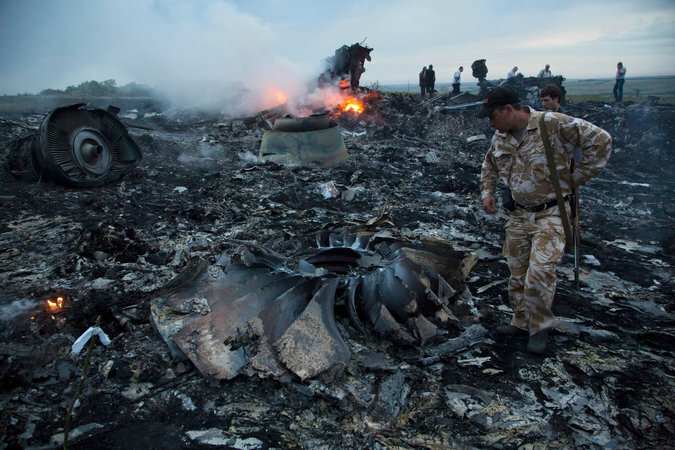 This is what is left of the Malaysia Airlines flight 17 after it was destroyed over the eastern Ukraine. It looks like a garbage dump in hell, complete with minor functionaries overseeing the wreckage. When coupled with the graphic tracking how all commercial flights subsequently are detouring around Ukrainian airspace, it also doubles as an image of what war does for economic development. You can bet that the one pattern will become a model for many others. But that is the least of it. Look at the photograph again. There used to be 298 people sitting in rows, minding their own business, and now they have been obliterated. That may be why the few people wandering through the wreckage are an important part of the photograph. They are looking, because that is all they can do. That is all the viewers of the photo can do. There is no possibility that the photo might impel some action that would make a difference to those now destroyed. No one is able to reverse the flow of time, pull the incinerated flesh and shattered materials back together, bring everything back to life as it was being lived, as it should be lived. We have arrived at a crime scene, and too late to do anything but ask why. And not the only crime scene. Girls are still enslaved by militias, villages terrorized by gangs, populations herded into camps. . . . Despite vast numbers of people living in relative prosperity and safety, that same world seems to be coming apart at the seams. As I’ve argued elsewhere, if the 21st century is experimenting with forms of violence, they would be visible at the margins: in failed states and quasi-states, occupied territories and zones of anarchy. Photography is already there, documenting the texture of destruction that is unfurling around the globe. Perhaps some day we will look back and say, “Oh, there clearly was a logic to it.” But that will be more than hindsight, for it also will be a mistake. Whatever is happening, it is madness. Photographs by Tyler Hicks/New York Times and Dmitry Lovetsky/Associated Press. The scene could be a community beach front almost anywhere in the world. Cabanas set up for those who can afford them. Tents and umbrellas for others. White sand, small dunes, and blue sea for everyone—swimmers, sailors, and those who just want to sit and catch the breeze coming in off of water. Sun bathers intermixed with children, families coming and going. Soon, one can imagine, the sun will be down, the tide will be up, and only a very few will remain on the beach. A quiet, restful place, with only the rhythmic sound of the waves beating on the surf, lights perhaps shining from the windows in the buildings lining the beach as a reminder of a living community. But for all of that, it is not just anywhere. 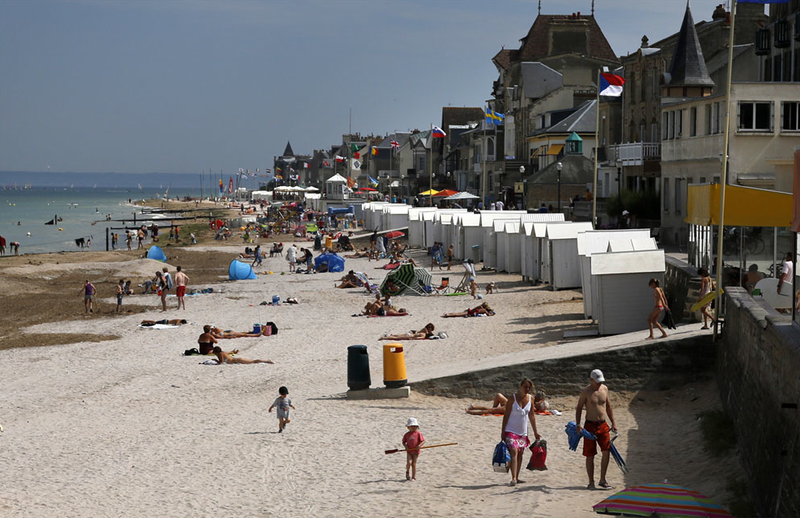 It is Saint-Aubin-sur-Mer, France. Seventy years ago this past week it was known as Juno Beach, one of the primary landing zones in the D-Day invasion. Taking this beach head was necessary to provide flanking support to the operations at Gold and Omaha beaches and to give the Allied forces a direct route to a German airfield near Caen. The beach was heavily fortified by two German battalions armed with over 500 machine guns plus numerous mortars, a defensive position enhanced by weather patterns that made it necessary for landing crafts to come as close to the fortifications as possible before releasing troops and equipment. The responsibility to take the beach head fell to the 3rd Canadian Infantry division, which suffered over 1,000 casualties by day’s end—the highest ratio of Allied casualties for anyone other than those landing at the more famous and costly Omaha and Utah beaches. Photographs, of course, only mark a sliver of time—typically only a fraction of a second that frames the here and the now in stark and radical terms. One cannot know what happened moments (or months or years) before this photograph was snapped, let alone what might happen even seconds after the shutter has opened and closed. Temporal continuities with the past, let alone alternate future possibilities can only be surmised. Such limitations don’t mitigate the value of images, but instead only emphasize the need for us to be imaginative in how we understand the reality that they put on display. And too, it requires us to recognize the ways in which the historicity of an image operates in tension with what it was then (or it what it might be later). It is, in short, part of an archive that has to be curated and engaged. 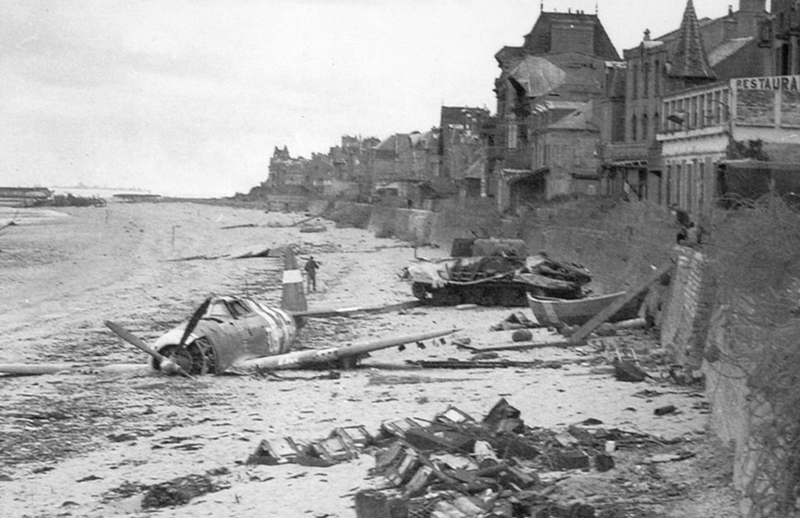 And so here we have Juno Beach shortly after the D-Day invasion. A crashed fighter plane where families today luxuriate. The detritus of battle washed up against fortifications that protected Axis forces from the landing Allies. The appearance of a solitary ghost town cast in somber grey tones where today colorful commerce flourishes, marked by the flags of multiple nations. This too, of course, was only a stark sliver in time. A scene of courage and fortitude, of death and destruction that can only remind us that what was before the lens when it clicked was there and then, even as it only framed a reality that could survive only in imagined memories.